Thanks to a collaboration between Beda’s Biergarten and the Doc’s Cellar custom brewery in San Luis Obispo, Beda’s Biergarten offers authentic Altbier, Kellerbier, and UrBeda Bock bier. 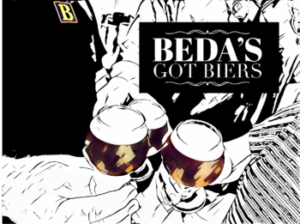 Here’s how the custom-crafted Beda’s Biers came to be. Bier (or beer) is more than just a beverage in Germany. It marks history, it defines cities—and it connects people. 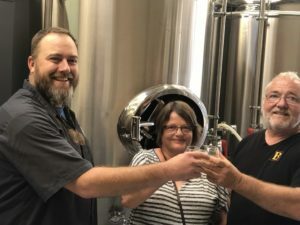 Like Beda and Helga Schmidthues, owners of Beda’s Biergarten in San Luis Obispo, who met over a glass of their favorite bier in one of their favorite breweries in Germany. Helga grew up in Düsseldorf, home to the Schumacher Brewery that was founded in 1838. One of its signature biers is Altbier. “Alt” means “old” in German, referring to Altbier’s “old” style of top fermenting bier. A sneak peek into BedaFest’s two new beers created just for the German beer loving fans here in San Luis Obispo. While Beda and Helga had known each other in school, they had lost touch. During Latzenbier, a special event held only one night a year, they were both at Schumacher Brewery and saw each other. That was 1978, and they’ve been together ever since. Beda and Helga moved to San Francisco in 1984, and they started Beda’s Biergarten in 2015. The restaurant offers many great German biers, including Beda’s beloved König Pilsener and several others. The only Altbier they could import from Germany was Uerige Altbier, but it was brewed for the US market, with more malt and higher alcohol content. Kellerbier is another rare bier they couldn’t find, which dates back to the Middle Ages in Franconia, Bavaria. It’s named after the cellaring (keller means cellar in German) process used to brew the bier at cool temperatures (originally in caves) during its slow maturation. But just like they created Beda’s Biergarten to share something they missed from their home country—in this case the gemütlichkeit, or the welcoming spirit, of their favorite pubs—they began to wonder if there was a way to share their favorite biers. While Helga and Beda began playing with ideas, a new business was brewing just a few blocks away. A toast to their new German beer collaboration. Beda and Helga Schmidthues from Beda’s Biergarten and Aaron Smith from Doc’s Cellar. Doc’s Cellar started as a craft fermentation supply company in 1991 and since then, had established itself as the go-to place for both equipment and advice for home brewers, craft breweries, boutique winemakers, and kombucha makers. 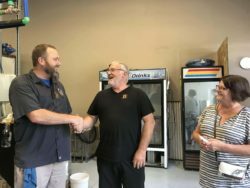 “When Aaron Smith from Doc’s Cellar approached us with their new custom brewing operation, we knew the time was right,” said Helga. After a few conversations, Aaron became the official Braumeister for Beda’s Biergarten. While Aaron has been in food and beverage manufacturing for years, as well as a talented homebrewer, he always said he didn’t want to open a brewery because he didn’t want to market and sell his beer. Doc’s Cellar received its brewing license earlier this year. 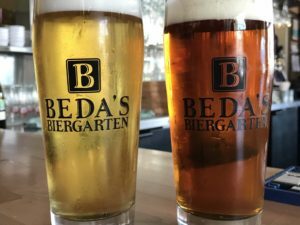 Their clientele will start with restaurants like Beda’a Biergarten who want a signature bier and smaller breweries, with plans to expand as demand grows. 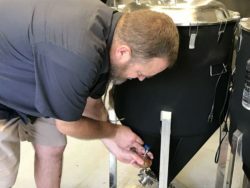 Brew Master Aaron Smith with Doc’s Cellars samples a Beda Bier in preparation for the rollout at 2018 BedaFest in San Luis Obispo. Aaron knew the styles and parameters of these biers, so he started researching recipes. “I found the actual Altbier recipe from the Schumacher Brewer in one of my old books,” he said. A welcome collaboration beer lovers Aaron Smith with Doc’s Cellar and Beda and Helga Schmidthues of Beda’s Biergarten. For the Kellerbier, he did a couple sample batches with input from Beda and Helga to arrive at the result that is every bit as good as the Kellerbiers from Bavaria. In addition to using authentic recipes, both biers are made according to the Reinheitsgebot purity law, introduced in 1516 by Duke Wilhelm IV of Bavaria. It requires that German biers contain only four ingredients: hops, barley, and water. Later, yeast was approved as an ingredient. A small batch of the first custom biers will debut at BedaFest, an afternoon of family fun hosted by Beda’s Biergarten on August 19 at La Cuesta Ranch in San Luis Obispo. Aaron will be helping pour and is happy to answer questions about these new styles he’s excited to be making. 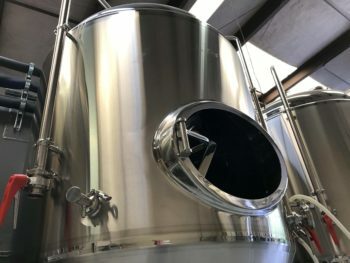 The new brewing tanks at Doc’s Cellar in San Luis Obispo are ready to take on the new collaboration with Beda’s Biergarten and their new German-recipe biers. The new beirs will debut at the BedaFest 2018. “If people like them, we will make them for the restaurant,” said Beda. “I’m not going to brew a pilsner or a dopplebock or a lager,” said Beda. “Why would we try to compete with such great biers like König Pilsener or Weihenstephaner Doppelbock? But they may consider a single Bockbier. The decision to brew custom biers with Doc’s Cellar is just another way Beda and Helga continue to share their hospitality and warmth with their Beda’s Biergarten family of customers. To that, we say danke schön! And prost!